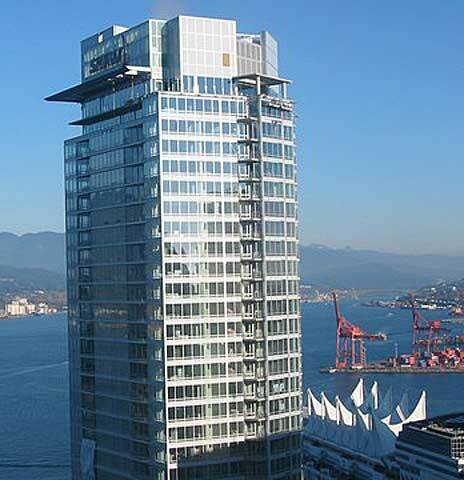 This state-of-the-art sculptural tower imposes a dramatic silhouette on Burrard Landing. The tower overlooks the expanding Convention Centre underway directly to the North. With the lower sixteen floors of offices--of which Shaw Communications occupies 12--and the upper 24 floors of luxury condominiums, living close to work has never been so manageable. The exterior curtain wall glazing system with its clear anodized aluminum framing and silver metal panel cladding is set off by a series of metal canopies, trellises with aerofoil louvres and tempered glass which brings a slightly aeronautic statement to the site. The minimalist lobby with its intriguing reflecting pools and colored "lightfalls" has a serene and serious air. The apartments offer tremendous views whether oriented north to the mountains and harbour or South, East and West to the city. Interiors by Robert Ledingham Design Inc are sleek and thoughtful. Ten full years of water penetration cover – twice the amount required by government legislation. That means piece of mind and also enhanced resale value.